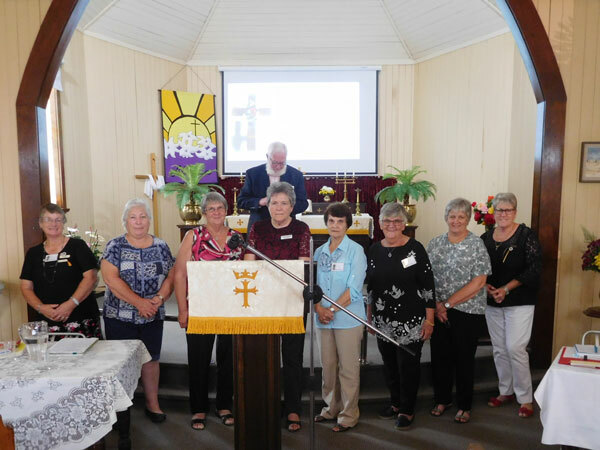 The 51st Darling Downs Zone Rally was held at ‘Holy Trinity’ Lutheran Church, Nobby on Wednesday 18 April, 2018. This was hosted by Nobby and Pittsworth Guilds. Thank you for morning and afternoon teas and great hospitality. 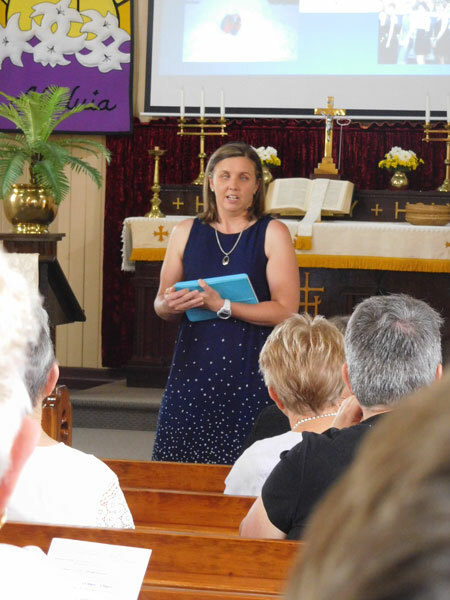 68 persons (LWQ Exec, DDZ members, Pastors and visitors) were in attendance to hear the truly inspirational testimonial of Lisa McEwan. She was born with cloudy corneas, less than 4% vision, so declared legally blind. She was able to complete her schooling (even being named as School Captain in Grade 12), take part in a twelve month Rotary Exchange program overseas and complete a BA Business at Griffith Uni. Every venture being told “no, she couldn’t do it”. She doesn’t consider her disability a burden as she still sees where God helps her every day. She is married and has two daughters, both with perfect sight. Many favourite Bible verses offer her Spiritual defence, humility, faith and trust (some of these were shared with everyone through a hand out). Ps 23:4 “…your rod and your staff, they comfort me” provides protection and guidance as she shares with others the love of God, proclaiming His promises and being ‘Indestructible in Christ’. This so beautifully tied in with the theme for the day INDESTRUCTIBLE (Hebrews 13:6). A large metal cross, considered indestructible, although weathered by rust marks, represents our shield, our fortress, our hope, our life. 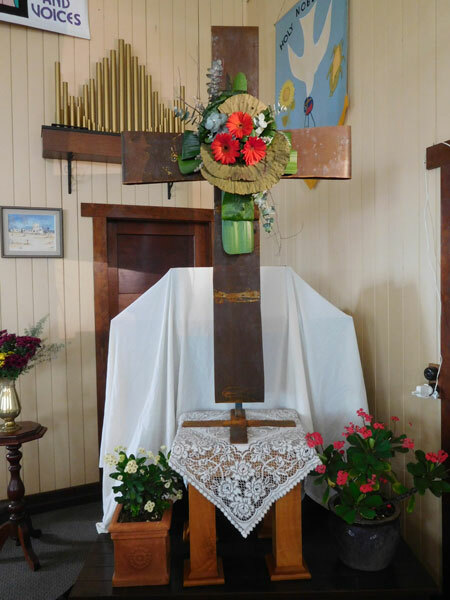 The floral arrangement in the centre – our growth in Christ, as we rise above the thorns that can destroy us. Pots of ‘Crown of Thorns’ plants stood at the base of the cross which was made by a Parish member. 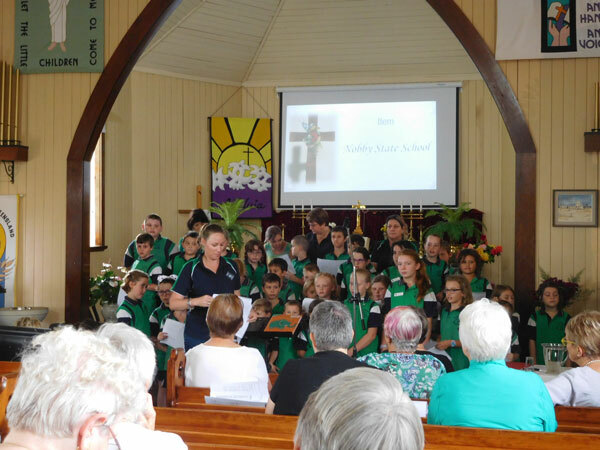 Another great moment was when the entire student body from the Nobby Primary School assembled to entertain us with renditions of well known Australian poetry and songs. These were all thoroughly enjoyed and acknowledged with hearty applause for their terrific effort. Ps Lionel Rohrlach (Pittsworth Parish) provided a though provoking Bible Study when he asked “what comes to mind when you hear ‘Indestructible’?” Responses of strength, Fort Knox, bullet proof, solid, unbreakable, everlasting etc, etc. If God is on our side, who can be against us? Really?? We have many fears for ourselves, our families, our church. We trust in God’s promises, the purpose of the cross can’t be taken away. Our faith, trust and hope are indestructible. “Let go – Let God”. Confidence of faith in Jesus, like the rusty cross on display, is indestructible. The indestructible DNA of who we are – baptised into Christ – cannot be taken away. Heb 13:8 Jesus Christ the same yesterday, today and forever! Various reports were presented. 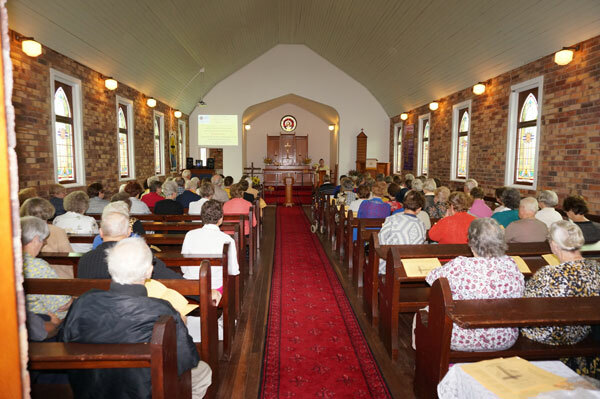 From our President, Meryl Rosenberger on the activities of the 19 Guilds/Fellowships within the Zone; the Financial Report from Treasurer Avalon Hall; LWQ Report from President Karen; LCAQD Report given by Ps Lionel on behalf of Bishop Paul; our Bargain Shops, Nazarene and Good Samaritan; Marie Pawsey, LLL Promotions Officer and the Redeemer Bookshop who were both present with displays and products. Zone Counsellor, Ps Robin Hoffmann, installed the 2018 Office Bearers, including new Secretary Cheryl Billiau (E: indian_maiden AT hotmail.com). He gave the closing devotion speaking of Satan’s attack on Jesus in the desert where Jesus showed he was indestructible. Then at his resurrection he defeated death and Satan – He is indestructible. In this victory of Jesus we are indestructible – He took the punishment. We are indestructible as our life finishes and we go through the gateway to eternal life.